Discussion in 'Transformers 3rd Party Discussion' started by Cheem The Rup, May 15, 2018. I don't own a single legends sized figure, but I've got to get me one of these. Damn it! Now I'm going to have get smaller hands. It only takes one and before you realize it you will have a small army on your desk. Just ask any of the regulars in the 3P Legends scale threads. My gateway figure was Hot Soldiers' version of Soundwave. Welcome to the club Novascreamer. Make a deal with the robot devil? Well, BB's original toy was not supposed to represent a real Beetle. 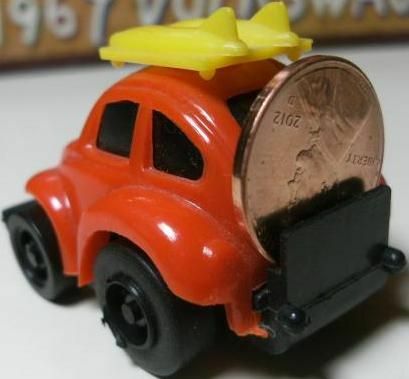 It was supposed to represent those old Penny Racer toys so that was supposed to be the clip that held a penny that weighted the back of the car down for hot wheelie action. I think the sticker was sort of supposed to look like an old VW custom turbo fan or something. I hate the tinier Legends scale. Too small! Whyyyy???? I understand doing your own thing, but we are just as likely to end up with 1 or 2 figures before this company (and new scale) disappear! That's annoying. That said... I'm in. So long as they don't price like IF! $35 would be a no-sale. Hopefully Magic Square's Beachcomber, Seaspray and Huffer work with this guy. Magic Square and DX9/UT seem to work together. This guy looks good with DX9's Soundwave and Ravage. I imagine Iron Factory's Warpath is sized similarly to the Deluxe CHUG, but have not seen a lot of comparisons yet. I NEED 3 OF THESE!!!!!! Makes me regret buying the hot soldiers one, for sure - unless this is like $40. I don't usually go in on guys like this but this might be the exception. So there's a chance for a toy-accurate face option? SOLD! I'd love a Glyph and Stinger from this guy, and with a little remolding, Goldbug. And then once they get their money's worth from this mold, they can move on to Cliffjumper (new mold resembling a Porsche, please!). I hope they are planning on a toy version and a Goldbug. It makes fiscal sense since this is their first release. A Goldbug would look good with DX9's season 3 characters and UT's Headmasters. Cliffjumper would be awesome; especially if he is as well armed as his Mech Planet version. Hell yeah, @antapp. Warpath looks like he’ll be about the same size as their Brawl, and might actually be a little bigger with his missile packs and gauntlet/shield/buckler. In fact, I’m a little surprised that it doesn’t seem like much was retooled from Armor Boar for Burning Slug. Still, it’s too soon to say whether New Age is going to redo the whole cast, @ZapRowsdower, or if they will stick to minibots. I would tend to agree with @zeroblue2099 that NA will make at least a couple more uses of the mold, though perhaps not quite as extensively as ImpossibleToys, for example. Or you could just get modeling tweeezers or forceps, like for making miniatures that go in glass bottles. Even 3rd Parties see the cash cow potential in Bumblebee. Yeah you'd think there would be more appeal if they can produce a Legends figure more in scale with the Hasbro version, and so far Mech Planet is the closest, but the style just isn't quite there. No 5MM hand ports and the vehicle modes just look too G1 toy styled...all squashed up looking. That's why, as cool as that little Iron Factory Warpath is, I'll have to pass. I'd like to have a more G1 style or at least Hasbro/Takara aesthetic to it than something that looks like a 3rd Party interpretation. It's close, but still not what I want for my collection. A Sunbow Scale fitting, legends scale Bumblebee that looks this good in both modes teased before I drop $40 on HS Cliffjumper and Hubcap? Heck yeah! Sign me up for one! Is that DX9's Dutch Trailer or MP Optimus's trailer? You know, this would be an interesting niche, G1 mini-bot size, but cartoon accurate and great articulation. Makes me want to not just see a Cliffjumper, but maybe a Windcharger, Brawn or Huffer done at this scale. Heck a whole cartoon accurate line of G1 toy scaled figures would be a sight. I really want a Brawn and Windcharger at this scale to display with Jetfire. I know it was only one episode but G1 Megatron getting shot with his own cannon always made me smile. Now that someone has final tackled Bumblebee at this scale I think the only really big G1 names not to get the 3p legends treatment are CJ, Hot Rod/Rodimus and Wheeljack.